It seems like every product we now look at features some kind of multi coloured LEDs designed to light up your case like Blackpool sea front but, in true style, Thermaltake have embraced the RGB styling like no other, offering it on almost every product that they now produce. The latest all-in-one CPU cooler that we’re looking at today is the Thermaltake Floe Riing RGB 240 TT Premium Edition. The name is quite a mouthful, granted, but it explains everything you need to know about the product in one fowl swoop. The RGB CPU cooler arrives in 3 different flavours, depending on the size of the radiator that you choose; 240mm (2x 120mm), 280mm (2x 140mm) or 360mm (3x 120mm). We’ve seen RGB pumps and we’ve seen RGB fans but Thermaltake are the first company to offer the entire package, complete with the hardware to control every single one of those 16.7 million colours. There’s also an application for iOS and Android devices which allows customisation of the CPU cooler. It might look great, but it has to perform rather well to warrant the £150 price tag. We’ll strap it to our Core i7 processor, turn up the clocks and see how it fairs. The Floe Riing RGB 240 TT Premium Edition is the world’s first 16.8 million colors liquid CPU cooler with two 120mm Riing Plus RGB fans and a LED waterblock. This cooler series features its extraordinary performance and superior quality. The large surface radiator plus high-performance waterblock and pump guarantees ultimate CPU cooling. Besides, the waterblock and the fans are manufactured with multiple addressable LEDs that can be controlled by Riing Plus RGB Software. Functions within the software also allow users to monitor fan performance and track CPU temperature. 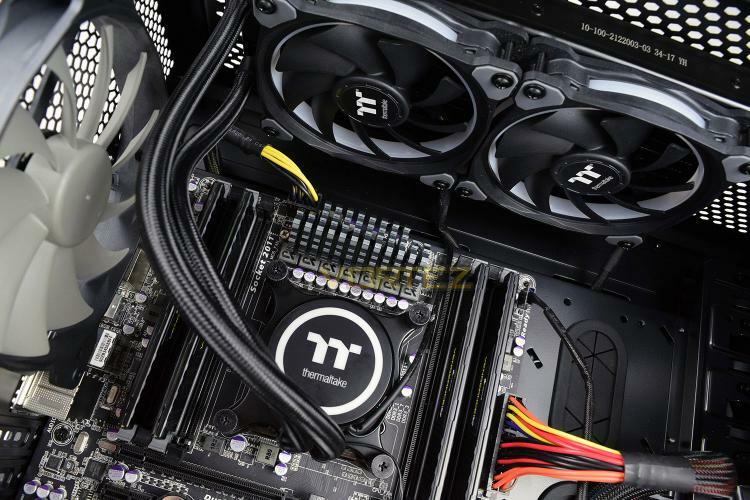 Enjoy better cooling performance and greater CPU protection with one simple upgrade!